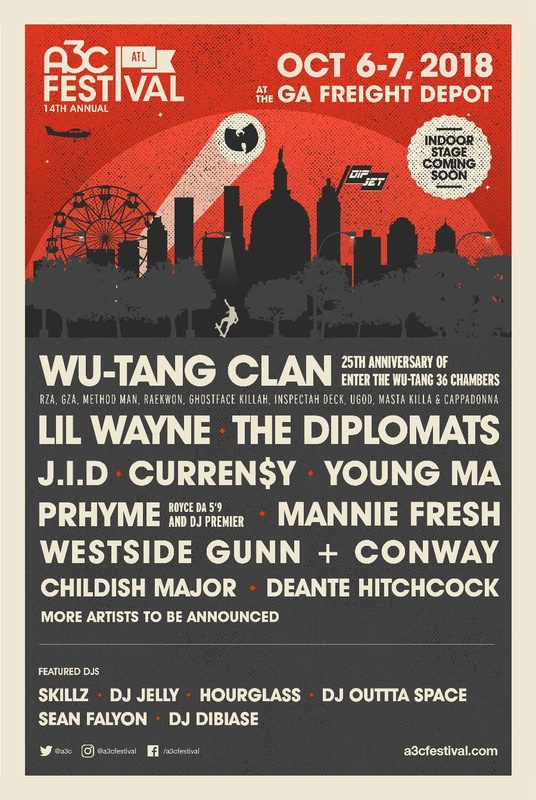 Dubbed as "Hip-Hop's Family Reunion," the A3C Festival is truly something special. The title of festival doesn't quite do it any justice though. A3C is dedicated to providing artists with the information, connections, and resources to be successful. There's an overwhelming source of opportunity available for anyone in the industry; from rappers, vocal artists, DJs, journalists, videographers, managers, marketers, and the list goes on and on. Conferences are held that service attendees with anything from inspiration to more tangible advice on their particular craft. The festival lineup (pictured above) isn't too shabby either. To summarize the gist of this monstrous hub of human networking in one article is impossible. Creative partners like Youtube, AKAI, and DJ Scratch Academy will be involved, while Speakers from RZA to Chris Atlas to CashmoneyAp to Drummaboy will be sharing knowledge on what they know best. Sets from Lil Wayne, Wu-Tang Clan, Dipset, Prhyme, Curren$y and many more will go down on the 6th and the 7th. A3C may be the only place to get hands on experience as artist management, learn how to scratch records, develop action plans for the community, and hear your favorite artist. On October 4th and 5th--amongst many other events--the A3C action summit will connect activists from all over to discuss and develop initiative plans. Just today they have also announced their Women in Charge program. Held on October 4, this A3C initiative connects, inspires, and educates women in the music industry through events, panels, and sessions led by hip hop’s most influential and innovative women. A3C is an amazing conglomerate of people, ideas, workshops, and entertainment. They find a way to make it all worth it for everyone, giving back in the act. Over the past three years, the A3C Action programs have given more than $30,000 to 17 non-profits chosen from more than 500 applications. In 2018, the A3C Action Accelerator will invite another group of activists seeking to create real change for an intensive bootcamp in Atlanta, culminating in a Pitch Night (October 5, 2018) where one organization is selected by a panel of judges to receive $10,000 in funding. To secure your pass, and to learn more details concerning the schedule and locations, visit here.